We’re officially within 10 days of Global Security Exchange (GSX) 2018! As the industry’s flagship event for more than 60 years, the newly rebranded GSX—formerly the ASIS International Annual Seminar and Exhibits—will deliver exciting updates to its annual conference at the Las Vegas Convention Center this year. With an expected 22,000 registered attendees, GSX is one of the largest gatherings of security professionals in the world—bringing together cyber and operational security professionals, vendor partners, media, students, and allied organizations for enhanced learning, career development opportunities, and access to the innovative technologies shaping how business gets done. Join us in this new feature area for education and hands-on demos exploring unmanned and interactive robotics. If you are looking to implement a drone program within your organization, need to hire a drone-as-a-service company to augment security, are concerned about how to counter the threat of rogue operators, seek to understand how to harden your facility to prying eyes or more dangerous incursions, or just want to learn about the latest cutting edge technologies, the GSX D3 Xperience will open your eyes to new possibilities! PLUS— have the chance to take your own turn at the commands to pilot a drone through the “gauntlet”—our own UAV obstacle course where the winning time will take home a DJI Phantom Pro system. The GSX D3 Experience is a brand-new exhibit hall feature brought to GSX 2018 with the support of the Association for Unmanned Vehicle Systems International (AUVSI). • The X Stage (Booth #4042) –Discussions at this stage cover topics such as frontier technology, innovation, and the future of security. Dynamic and leading-edge educational tracks, panels, and discussions focused on embracing technology to find effective solutions to security challenges make the X-Stage a must-see stage. • The Xperience Stage (Booth #141) – This stage is all about case studies, evidence of effectiveness, and the argument for efficiency. Here, you’ll find showcases of tried-and-true best practices and conversations that are focused on underlining success factors, rather than the value of a specific product. • The Xcelerated Exchange Stage (Booth #151) – At this stage, enjoy town hall-style discussions, debates around current security challenges, and various applications of technology and procedure. This stage provides a forum for the discussions that need to take place between practitioners and solution providers to propel the industry forward. Continue the conversation from the X Stages, while also recharging, relaxing and networking with peers. The Con-X-tions Lounge is THE place to be as our industry-leading speakers socialize with GSX-goers after their X Stage presentations. Be sure to stop by Career HQ, where you’ll find FREE resume reviews, a professional Headshot Studio with award-winning photographers and makeup artists, one-on-one career coaching sessions, professional development sessions, and networking opportunities with leading employers and industry professionals. As we speak, organizations like the Department of Homeland Security and Apple are looking to hire talent like you, and they know that the best talent around will be at the Career HQ Career Fair. Register in advance to increase your opportunity to interact with employers before, during, and after the event! McFarland will close out the conference on Thursday, 27 September with her address, which will take attendees on a fast-paced geopolitical tour around the globe. As the first deputy national security advisor in the Trump Administration, she will share an insider’s perspective on critical foreign policy and defense issues. 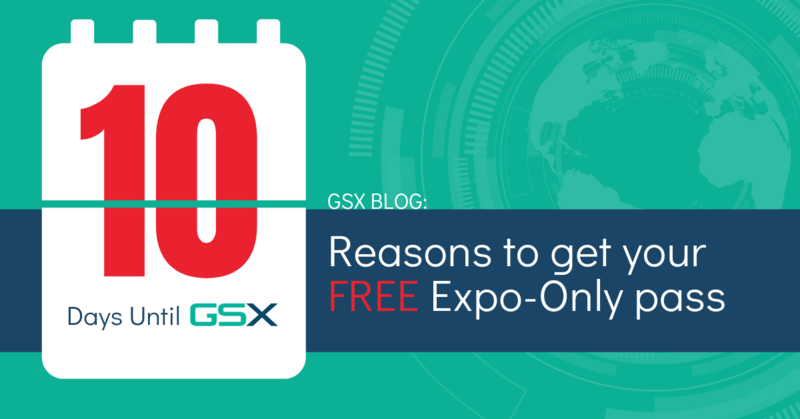 The Thursday is open to all GSX registrants—including those with Expo-Only registration. Join us for happy hour in the exhibit hall to celebrate the end of the first day of the show! Enjoy complimentary drinks as you network with your peers and colleagues and explore essential solutions at this interactive happy hour, designed to increase your connections. Connections are made all throughout GSX—in exhibit hall sessions, receptions, lunches, and the exhibit hall—you never know who you’ll meet next! And there’s no better place to network with the global security community than these must-attend events. Don’t miss this once a year opportunity!